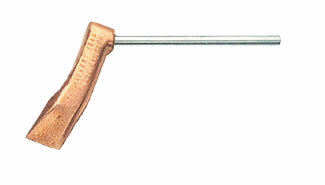 PRODUCT: Sievert #7017-20, 19 Oz (500 gram) Diagonal Hammer Copper Soldering Bit. Fits Sievert Pro 86 Handle (#3486) and ESK models. Price/Each. APPLICATIONS: Used in sheet metal work including roofing and gutter soldering. Sievert #2955-01 Soldering Burner, 9200 BTU. Soldering iron burner for sheet metal work. Works with Pro 86 Gas Torch Handle (not included). Price/Each. Sievert #7016-33, 10 Oz Copper Diagonal Long-Life Soldering Bit / Soldering Tip. Provides 1500 meters of soldering. No re-hammering or filling. Fits Sievert Pro 86 Handle(#3486) and LSK or SIK kits. Price/Each. Sievert #7017-25, 19 Oz (500 grams) Diagonal Copper Soldering Bit / Soldering Tip, Long-Life Design provides 1500 meters of soldering. No hammering, no filling. Fits Sievert Pro 86 Handle (#3486) and LSK or SIK kits. Price/Each.